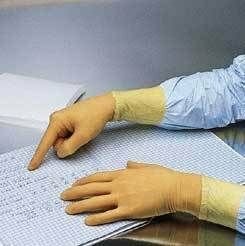 powder-free natural latex gloves are clean-processed to protect your sensitive environments from contamination by particulate matter. These hand-specific, 7-mil, 12"-nominal-length gloves are tough, flexible, dependable and strong. Multi-Flex latex gloves have thin fingertips to ensure optimum fit, sensitivity and dexterity required for small parts manufacturing. A slip-resistant finish gives you a good grip. Our multilevel, bag-in-a-bag packaging provides added protection against contaminants.